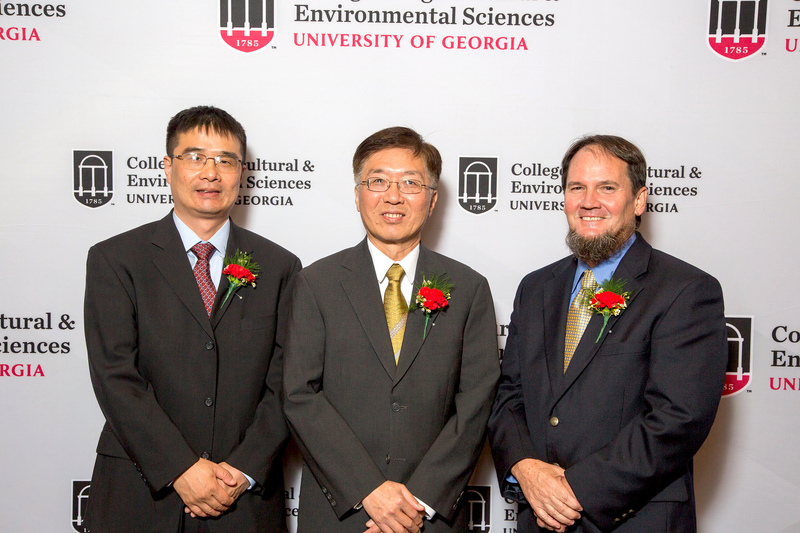 Soil scientist Jack Huang, food scientist Yen-Con Hung and entomologist Dan Suiter (pictured left to right), all members of the UGA Griffin Campus faculty, were recently awarded D.W. Brooks Awards by the UGA College of Agricultural and Environmental Sciences. Qingguo “Jack” Huang, professor in the Department of Crop and Soil Sciences, received the 2018 D.W. Brooks Award for Excellence in Research. The award recognizes his research into the remediation of organic compounds in polluted soil and water. Huang pioneered a method of using enzymes to break down long-chain organic compounds into less harmful compounds, which enables their removal. His work has resulted in four patents since he joined UGA in 2007. Yen-Con Hung, a professor in the Department of Food Science and Technology, received the 2018 D.W. Brooks Award for Excellence in Global Programs. The award recognizes his commitment to international outreach and collaboration that has helped to build safer food systems around the world. Hung’s work with the international food safety research community has helped implement best practices for minimizing foodborne illness across the world. Through his outreach efforts, Hung has helped to develop food safety protocols and communication networks in developing countries. His focus is on the postharvest safety of culturally relevant crops like cowpea and peanut. Dan Suiter, a professor in the Department of Entomology, received the 2018 D.W. Brooks Award for Excellence in Extension. The award recognizes structural and urban pest management trainings he’s developed and presented across the Southeast and around the world. Director of the Structural Pest Control Training Center on the UGA Griffin campus, Suiter teaches hundreds of pest control professionals each year and reaches thousands more online through continuing education classes, which attract viewers from as far away as Afghanistan. Since 2007, he has taught more than 30,0000 people in more than 20 U.S. states.